SOUTH PORTLAND, Maine — Two men were killed Saturday when the small plane they were in crashed into a city street shortly after taking off from Portland International Jetport, officials said. The Yak-52, a Soviet training aircraft introduced in the 1970s, crashed at about 3:30 p.m. Saturday on Western Avenue, a normally busy road lined with strip malls, retail outlets, offices and manufacturing plants. Authorities say the crash of the two-seater plane killed 42-year-old pilot Mark Haskell of Brunswick and 66-year-old Thomas Casagrande of Portland. Federal Aviation Administration investigators were called to the site, and a portion of Western Avenue was blocked to traffic Saturday night while the crash was being investigated. Crews were expected Sunday to reopen the road, which is in the Maine Mall area. The National Air Traffic Controllers Association says it is mourning the death of Haskell, an air-traffic controller at Portland for 19 years. The NATCA said in a statement Sunday that Haskell’s death left anyone who knew him shocked and saddened. Justin Crabtree, 32, of Portland was leaving a nearby Staples store when he saw the plane make a sharp turn before diving. “It was just a sharp turn and straight down to the ground,” he said. When Crabtree ran to the plane, he saw two men inside. “They were both passed away — hopefully, on impact so there wasn’t any suffering,” he said. 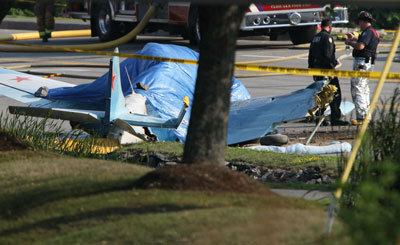 After the crash, people gathered in parking lots to view the plane, which was covered by a blue tarp with the pilot and passenger still inside. Its tail had a red star on it and jutted out from beneath the tarp. Jordan Jackson, 12, of South Portland said he watched the plane from his backyard and took note because it was an older, unusual-looking plane. “It took a wicked sharp turn; it went up and then down,” Jackson said. The plane was based at the nearby Portland International Jetport, but it wasn’t immediately known where it was headed, jetport Director Paul Bradbury said Saturday. According to a website about the aircraft, it was bought by Haskell in 2001 and named Lizzy-Lou in honor of his daughter, who was born on the day the contract was signed. The plane served the Romanian military as a trainer and airshow craft before it was shipped to the United States.